The conservative NYT columnist steers the conversation away from economics and toward “behavioral” terrain. 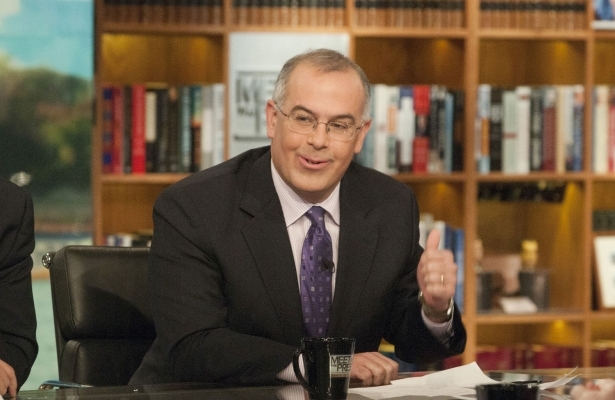 “Suddenly the whole world is talking about income inequality, leading us off in unhelpful directions,” writes New York Times pundit David Brooks. The primary problem, he adds, is that “What we call ‘inequality’ is caused by two different constellations of problems. At the top end, there is the growing wealth of the top 5 percent of workers…. At the bottom end, there is a growing class of people stuck on the margins, generation after generation.” According to Brooks, “If you have a primitive zero-sum mentality then you assume growing affluence for the rich must somehow be causing the immobility of the poor.” I would not call David Brooks’s arguments “primitive”—“evasive” and “deceptive” would be more like it. For starters, if the top 1 percent of Americans enjoyed 95 percent of the income gains from the 2009–12 recovery—as happens to be the case—the problem with “inequality” is hardly one affecting only those Americans “stuck on the margins.” Today, the share of national income going to corporate profits has hit a record high, while the share going to wages has reached a record low. Coincidence? Not so much. As the Seattle-based venture capitalist Nick Hanauer explains, “Low-wage jobs are fast replacing middle-class ones in the US economy. Sixty percent of the jobs lost in the last recession were middle-income, while 59 percent of the new positions during the past two years of recovery were in low-wage industries…. By 2020, 48 percent of jobs will be in those service sectors.” That’s quite a big “bottom,” it turns out, and it comes in the wake of a massive shift in wealth in the same direction during the past thirty-five years, with the share of our national income going to the top 1 percent doubling and that of the top 0.1 percent nearly tripling, according to economists Thomas Piketty and Emmanuel Saez. Brooks’s analysis, moreover, nowhere accounts for the far more extreme version of “inequality” experienced by the United States compared to other advanced industrial nations. This is due, in significant measure, to the capture of much of our government by the super-rich via our corrupt-but-legal money-centered political process, which has enabled them to protect and extend their gains. As Cornell University economist Robert Frank notes, “Greater income and wealth in the hands of top earners gives them greater access to legislators. And it confers more ability to influence public opinion through contributions to research organizations and political action committees. The results have included long-term reductions in income and estate taxes, as well as relaxed business regulation. Those changes, in turn, have caused further concentrations of income and wealth at the top, creating even more political influence.” They employ this influence not merely to manipulate the tax code for the benefit of billionaires and to weaken the laws protecting workers’ rights to organize, but also, as Jacob Hacker and Paul Pierson point out, to offload the cost of “negative externalities” on the rest of us. The “spectacular profits of the energy industry,” for instance, depend on “the failure of regulation to incorporate fully the social and economic costs associated with environmental degradation, including climate change.” Much the same can be said about Wall Street, of course, which was responsible for the massive social damage caused by the 2008 meltdown. Some contributions to research organizations and political action committees have the effect of promoting ideological nostrums that serve the interests of the wealthy but have little basis in lived economic reality. For instance, Brooks cites two economists and “some other studies” to argue that increases in the minimum wage have not had “any effect on the poverty rates.” Alas, seventy-five well-known economists, organized by the Economic Policy Institute, released a letter to congressional leaders and President Obama that begs to differ. In arguing for a graduated rise in the federal minimum wage from $7.25 to $10.10 per hour, they observe, contra Brooks: “The vast majority of employees who would benefit are adults in working families, disproportionately women, who work at least 20 hours a week and depend on these earnings to make ends meet.” They estimate that roughly 17 million people would be positively affected.